FIRST EUROPEAN ECOLABEL-CERTIFIED ALPINE SHELTER ! The European ECOLABEL is the community system of labelling for both products and services. It was issued by the European Community 1980/2000 regulations. The products which earn the labelling are widely consumed goods or services that have got through the screening criteria fixed by the European Commission. They were designed to reward environmental care and products quality. > we only use local or biological products. > we effect a separate collection of household waste. > we only use Ecolabel brands. > we pay the utmost attention to the environmental awareness of our clients. >we periodically attend specific training courses on these matters. The environmental policies of the Shelter. The "Daniele Arlaud" Mountain Shelter, well aware of the environmental interactions produced by its own touristic activities, strongly intends to become an environmental care model for all mountain shelters. Having acknowledged that the environment is a paramount resource for both tourism and leisure time, we also acknowledge that tourism is, in its turn, a great opportunity to safeguard and enhance the importance of the environment. The Gran Bosco Regional Park Board of Salbertrand, actual owner of the facilities, and miss Elisa Pecar, manager of the shelter, have then committed to reduce the impact of both the mere existence of the shelter and the services it offers on the surrounding environment. They have also committed to respect all Community, State, Region regulations on the matter and of course to respect the rules of the abovementioned ECOLABEL labelling system. Environmental quality is the most important aim of the ECOLABEL system, and the Arlaud Shelter firmly intends to pursue it through a constant monitoring and bettering of its environmental impact. 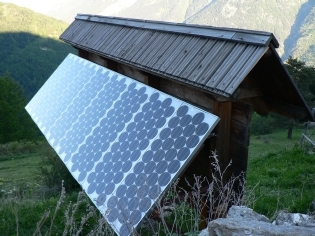 The "Daniele Arlaud" Mountain Shelter commits to pay due attention to limiting energy consumption as much as possible by adopting, where possible, managing technologies and techniques that may prove innovative in terms of endurableness. In order to reduce the production of some specific waste products the "Daniele Arlaud" Mountain Shelter commits to adopt prospective measures, like aptly planned purchases and carefully carried out procedures of both transportation and clearance of waste. 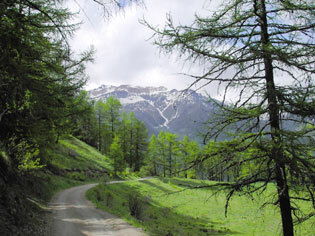 The "Daniele Arlaud" Mountain Shelter believes a correct environmental information of the public to be of strategic importance not only in regard to its own internal rules but also in regard to any activities organized within the boundaries of the park. This is why we commit to promote and spread what we call "good environmental policies" through proper informational instruments. The training of the staff, both temporary and permanent, will be carried out through training courses the manager herself will be attending regularly in order to instruct then all the members of her team. The "Daniele Arlaud" Mountain Shelter commits to carefully monitor the consumption of energy, water, chemical substances and the production of waste in order to file in its own data archive and be able to evaluate the betterments. All suppliers will be carefully evaluated to identify the best environmental performances of the products available. In compliance with the abovementioned criteria we will then favour those suppliers who are Ecolabel certified, who certify their environmental impact, who deal in local or typical products.